Happy Wednesday and happy October 3rd! If you caught my post earlier on Instagram you would've seen my mean girls reference! lol. 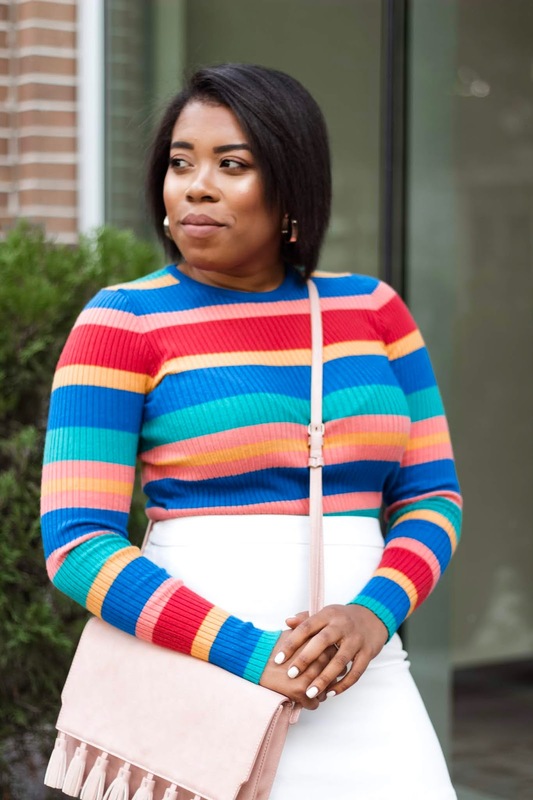 Although I'm not wearing pink I wanted to share this super cute colorful striped sweater I posted on Instagram last week. We're not quite at the point where we can really break out all of our sweaters here in the South but I couldn't wait to share this. This sweater is such great quality and thick enough to where it would really keep you warm. I love how it's ribbed and the colors are so fun! This sweater was only $16, so I've been thinking of picking up the other two color combos. 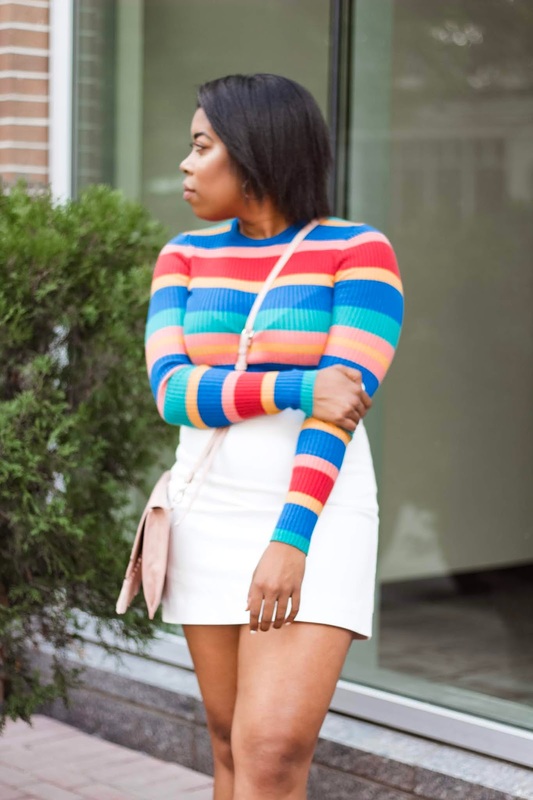 This sweater really reminds me of the 80's...think of Rainbow Bright doll vibes; don't believe me, check out my Instastories for a comparison pic. lol I tucked this into a classic a-line cream mini skirt from Express. I love how crisp and clean this color is Fall and I love how it makes the colors of the sweater pop even more. 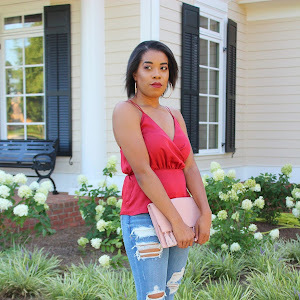 This skirt can be dressed up or down. I've shared this before on my Instagram with another sweater with just the front tucked in and it was super cute. This skirt comes in two other colors and this skirt is currently on sale for only $14, this was originally $50. 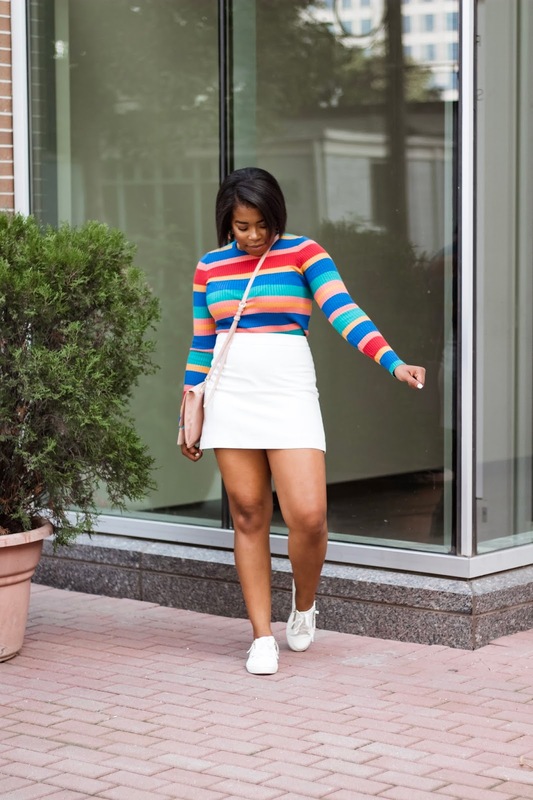 You definitely need this skirt in your wardrobe!